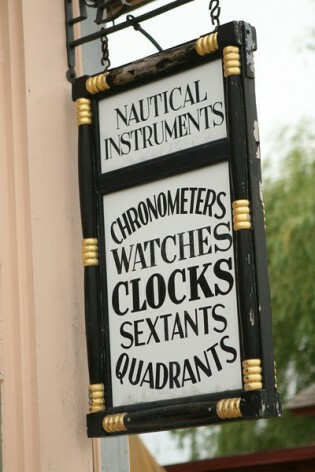 A seaport town large enough to have different captains and mates arriving and embarking on a daily basis would very likely have a business like the Museum’s Nautical Instruments Shop. Here the ships’ officers could purchase or have adjustments made to their precise and somewhat delicate navigational tools. 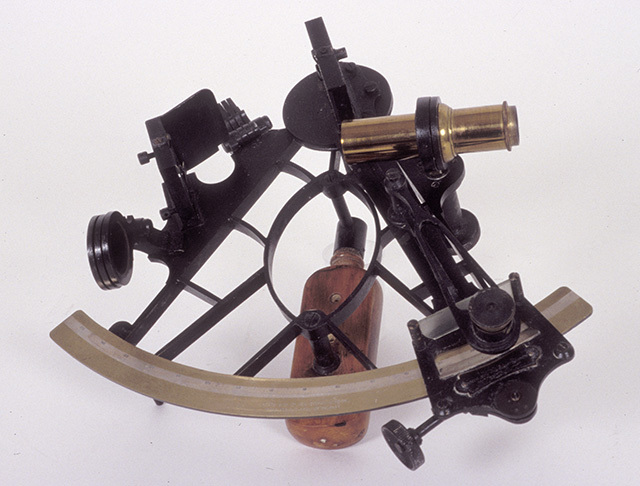 The sextant, its name derived from the Latin meaning one sixth of an arc of a circle, is one of the most important nautical instruments that sailors and mariners relied upon for years, well before the creation of the first GPS systems. To find their way at sea far from the sight of land, captains depended upon their quadrants and sextants–used to measure the angle between the horizon and a star (frequently the sun)–and their ultra precise time piece, a marine chronometer, along with nautical charts and tables to determine their exact location on the watery world. A person skilled enough to adjust that most precise clock could also repair the family mantelpiece clock. One will find plenty of examples of both types of timepieces along with tall case clocks, compasses, barometers, quadrants, sextants, telescopes, and charts from the 19th century in this exhibit. Visitors to the Nautical Instruments Shop can learn from the Interpreter on duty how those tools all work together in the skill called navigation. A large-scale sextant for visitors to try is available in the Treworgy Planetarium lobby. Navigation demonstrations are also scheduled seasonally. Explore 19th-century navigation at the Treworgy Planetarium.